You may be familiar with cards of this type from the recent examples like Kaladesh‘s Lost Legacy, but did you know that it’s one of the design archetypes that we originally got from Unglued? It was originally Look at Me, I’m the DCI, which is actually still surprisingly relevant (in a sense) compared to its cheaper descendants because it can remove cards from sideboards. The thing I really like about Slaughter Games, though, is that it is in colors that are very good at applying early pressure and disruption. If you lead with Rakdos stalwarts like Return to Ravnica unleash creatures, or throwbacks like Dark Confidant and Shadow Guildmage, your opponent might still be hoping to answer them and delay until they land Teferi . . . until you cast Slaughter Games and get rid of their answers, or of Teferi, and they can’t really stop it short of Leyline of Sanctity. It sometimes feels a little bad if you find that your opponent only has one or two of the card you named rather than four, but the effect is rarely worth nothing, and there are certain cards that black-red decks will struggle to deal with in any other way. Heck, its high unstoppability score means I’d even consider it in Filth Casserole! I just wanted to finish by commenting that yes, the art is basically the same concept as Village Cannibals from Innistrad; yet I actually find Slaughter Games scarier. I think it has to do with the fact that something similarly horrifying is happening in an environment that’s light and bright and almost cheery apart from the knives and hooks. Cranial Extraction, but uncounterable. Slaughter Games was a big player in Return to Ravnica-era Standard, because removing a deck’s win condition was a good way to go. (And getting rid of Sphinx’s Revelation also was a good way to go, since it was a major force.) Four mana is on the expensive side for the effect, and it lacks the ability to hit cards like Valakut. 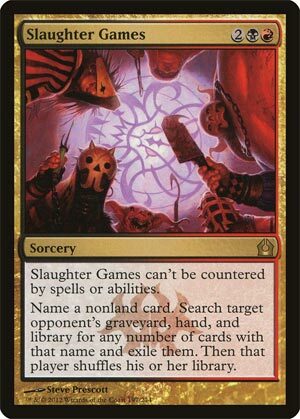 But if you want information and the ability to kill your opponent’s deck dead, Slaughter Games is one of the ways to go about it.